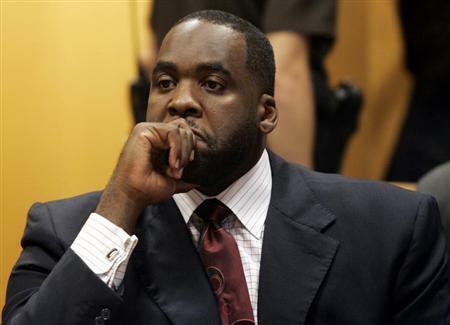 [www.inewsguyana.com] – Former Detroit Mayor Kwame Kilpatrick was sentenced on Thursday to 28 years in prison for corruption, the apparent last step after a series of scandals destroyed his political career and helped steer a crisis-laden city even deeper into trouble. In March, Kilpatrick, 43, was convicted of racketeering conspiracy, fraud, and extortion and tax crimes. The government called it the “Kilpatrick enterprise,” a yearlong scheme to shake down contractors and reward allies. He was doomed by his own text messages, which revealed efforts to fix deals for a pal, Bobby Ferguson, an excavator who got millions of dollars in city work through the water department. Contractors said they were forced to take on Ferguson as a partner or risk losing lucrative deals. The government alleged that he in turn shared cash with Kilpatrick. Agents who pored over bank accounts and credit cards said Kilpatrick spent $840,000 beyond his salary during his time as mayor. Defense attorneys tried to portray the money as generous gifts from political supporters who opened their wallets for birthdays or holidays. The government said Kilpatrick also tapped a nonprofit fund, which was created to help distressed Detroit residents, to pay for yoga, camps for his kids, golf clubs and travel. “A man with the charisma and ability of Mr. Kilpatrick chose to use his talents on personal aggrandizement and enrichment when he had the potential to do so much for the city,” Judge Nancy Edmunds said before imposing the sentence. The sentence was a victory for prosecutors, who had recommended Kilpatrick serve at least 28 years in prison, while defense attorneys argued for no more than 15 years. Kilpatrick, a Democrat, quit office in 2008 in a different scandal that was extraordinary at the time but seems smaller compared with the sweeping federal probe that has led to the convictions of more than 30 people. Sexually explicit text messages revealed that Kilpatrick had lied during a trial to cover up an affair with his top aide, Christine Beatty, and to hide the reasons for demoting or firing police officers who suspected wrongdoing at city hall. Detroit voters soon will elect a third mayor since Kilpatrick’s departure, although the city is under the control of an emergency manager, Kevyn Orr, for at least another year. Orr, with the blessing of Michigan’s governor, took Detroit into bankruptcy in July, saying there was no other way to solve $18 billion in long-term debt. The case is pending. “Kilpatrick is not the main culprit of the city’s historic bankruptcy, which is the result of larger social and economic forces at work for decades. But his corrupt administration exacerbated the crisis,” prosecutors said in a court filing last week. CBS Detroit reports that Kilpatrick spoke in his own defense immediately before the sentence was handed down, giving a lengthy talk full of apologies and self-reflection in a subdued voice that riveted the packed courtoom and overflow room.